You’re all settled into your home. You know all the strange night creaks, you have put your unique personality into it with your possessions and you love it. But, now you must maintain it. A home comes with great responsibility and some elbow grease. You need some tools to keep it in excellent condition. 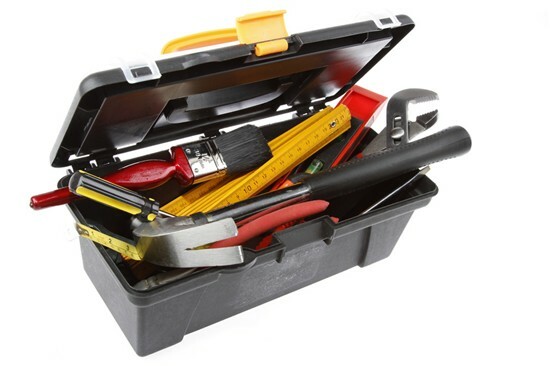 Here are some items you will want to include in your homeowner tool kit. You don’t have to have to be an expert carpenter to make your home comfortable for you and your guests. These homeowner tools are great for minor maintenance. Toolbox: Sure, you can leave your tools in drawers or leave them lying around loose in the garage. But, you will be less likely to lose them if you have a place to organize them. Hammer: This is a must. Use the claw end to remove stubborn nails or use the strong end to bang bed frames into position or hang pictures. Screwdriver: This is a very handy tool to have. Open sealed paint cans, hang curtain rods, or install light receptacle covers. Plunger: Unclog sinks and toilets. You don’t need to be an expert plumber to use one. Flashlight: You will have to work in places of low visibility many times. There is no point in squinting through your work. Utility Knife: For rough work it is best to use a replaceable blade. There are many models available that are cheap and easy to use. Duct Tape: It may be fun to joke and say that duct tape fixes everything, but it isn’t far from the truth. For temporary fixes, it works miracles. Now that the minor maintenance in your home is accomplished, you may want to rest from exhaustion, or you are looking around for more things to fix in your home. If you are in the latter category, you might need to add more tools to your collection for home maintenance. Pliers: Use these to grip anything from wires to screws that may be stripped out. Putty Knife: Fix holes in the wall, use the edge to scrape up tiles, or use it to run a bead of caulk over the bathtub. There are many uses for it. Wheel barrel: Don’t struggle with trash bags that tear easily and spill the contents and undo all of your work. Tape Measure: Don’t just assume you know what the right length is when you are installing cabinets, tiles, or doors. Do it the right way. Measure then measure again to be certain. Socket Set: A good socket set with dependable wrenches can save you a lot of time looking for a wrench that may or may not be in your toolbox. For bigger jobs you will need more advanced tools. These tools require a power supply, goggles and maybe earplugs in some cases. Screw Gun: This is great for hanging drywall or replacing your deck, and it saves you a lot of time. Drill: In some instances, you need a drill to make your own screw holes. Circular Saw: If you need many boards of equal length you can spend hours with a handsaw or minutes with a good circular saw. Miter Saw: If you need boards cut at a specific angle, this is excellent. Saw Horses: If you invest in saws, it’s a good idea to get yourself a pair of saw horses to make your life that much easier. The list of power tools is limitless. They are designed to get the job done quicker and more efficiently and require practice using them. All of these home improvement tools are just a few in a long list of items you can have for the endless tasks around the house. When maintained and properly used they can go a long way for you.